Solo classical guitar from the ECM stalwart whose music is so beautiful that it can seem vanilla. But it isn't. 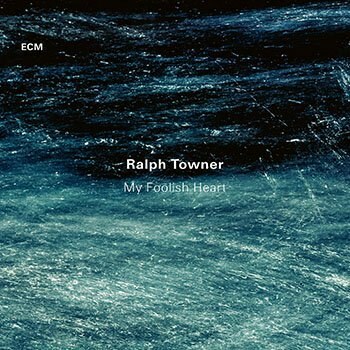 Ralph Towner makes beautiful recordings that might be mistaken for sonic wallpaper by a lazy listener. His longtime collaboration with ECM Records, over 40 years old, has created almost two dozen atmospheric explorations. A few are minor classics: 1975’s duets with vibraphonist Gary Burton, Matchbook, Sargasso Sea with fellow guitarist John Abercrombie, and Oracle with bassist Gary Peacock (1993), at least. The danger, however, is that Towner’s gentle acoustic sensibility becomes the aural equivalent of oatmeal, nutritious but in search of musical raisins. Towner’s latest, My Foolish Heart is for solo guitar, and it requires the veteran of the Paul Winter Consort and the cooperative folk/jazz group Oregon to vary his playing to sustain interest. Listeners with a hunger for subtlety will find a feast here, played on classical guitar but in several styles and modes. Sonically, it might be inevitable that Towner's music seems corralled into a chamber-jazz of folk-jazz pen. But he shouldn’t be mistaken for New Age meditation aid. His tunes and technique push him toward pleasing textures but fascinating melody and unusual rhythms. Naturally, My Foolish Heart contains a performance of the Victor Young ballad. It’s a standard that we’re used to hearing in an intimate way, but Towner’s version is energetic and full of a craggy, interesting back and forth between melody and chordal movement. He takes two full passes through the song’s 32 bars, sticking mostly to the written melody and adding a beautiful coda. The interest, however, is less in a “solo” or improvised melody and more in the way that Towner casually rambles through the form, gluing the melodic line to the harmonies, strummed, plucked, and arpeggiated in his unique style. The bulk of the music here either works in that vein or feels even more unified in its arrangement, with the melody woven into the accompaniment organically. “Blue as in Bley” threads its melody onto a rolling chordal structure that seems organic to the guitar. Even more expressive and whole is “Rewind”, the album closer with a sunny theme that zigs and zags in runs that are punctuated with chiming chords. Other tunes are structured even less like standards. “Clarion Call” is a highly textured, cinematic tune that moves across different soundscapes that could only be created on a guitar. It isn’t structured around a “melody” with accompanying chords but more like a series of sonic moods that progress in waves. “Pilgrim” works from a melody that seems half-Celtic and half classical, with lots of nylon string care in the arrangement. Towner moves across the beautiful minor harmonies like a pro, but what he does in his improvisation is striking. He plays single-note melodies without accompaniment that are paced by strummed sections of the written chord pattern. Each one is a small gem. Similarly, “Dolomiti Dance” is a super-detailed workout in a folk-classical mode: busy, fast, astonishing. Is Towner, then, really a “jazz” guitarist? First of all, who cares? He is a keen, rhythmic improvisor whose phrasing and attack “swings” with the momentum of several rich American musical traditions. “Saunter” is one of my favorite tunes on My Foolish Heart, a bluesy workout that cruises through beautiful chord changes that would work on a Pat Metheny or John Scofield record. Because Towner plays “Saunter” on acoustic guitar all by himself, the product sounds less like “jazz”, but it has the pleasures in hand — surprise, urgency, and a sense of discovery. ECM Records makes Towner’s guitar sound like a gorgeous thing, a resonating font of profundity, and that’s not always what I want to hear. “Two Poets”, a two-minute tone poem, rings and reverberates like the voice of an actor from the Royal Shakespeare Company . . . and it has perhaps some of the pretension of such a performance, with every note given a sense of lonely importance. A spritely performance like “Shard” (just a tradition, really, of less than a minute to another tone poem piece) is perhaps robbed of its rhythmic fun by ECM’s aural grandiosity. But all the music here is thoughtful, and so much of it has a beautiful urgency. I recommend it for the kind of close listen that might have been more common back in the day of LPs and headphones perched on ears that need an immersive experience. Towner is a tiny orchestra unto himself.